On the day before a coronation the Regalia are brought from the Tower to Westminster and deposited in the care of the Dean for the ensuing night. It is a reminder of the fact that until the 17th century the greater part of the Regalia was kept permanently in the Treasury of Westminster Abbey. This ancient chamber, better known as the Chapel of the Pyx, was entered originally from the vestibule of the Chapter House, where a door, which still retains fragments of human skin upon it, proclaimed the fate which awaited anyone who attempted to enter it with unlawful purpose. Within this Treasury in chests and boxes (pixides) were kept the crowns, sceptres and royal robes which were used at successive coronations. The Sovereign’s Orb, symbol of the dominion over the earth of the Christian faith, the Spurs of St. George and the Coronation Ring. 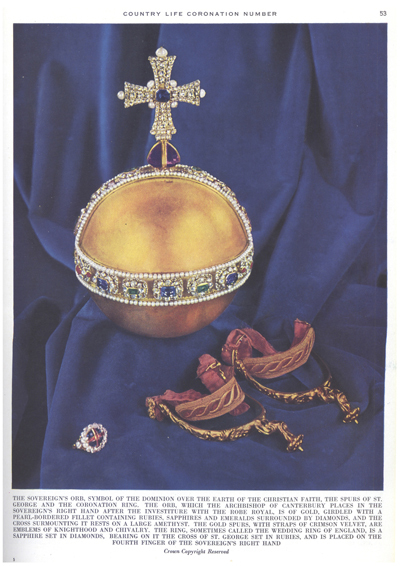 The Orb, which the Archbishop of Canterbury places in the Sovereign’s right hand after the investiture of the Robe Royal, is of gold, girdled with a pearl-bordered fillet containing rubies, sapphires and emeralds surrounded by diamonds, and the cross surmounting it rests on a large amethyst. The gold spurs, with straps of crimson velvet, are emblems of knighthood and chivalry. The ring, sometimes called the Wedding Ring of England, is a sapphire set in diamonds, bearing on it the Cross of St. George set in rubies, and is placed on the fourth finger of the Sovereign’s right hand. In 1643 Parliament decided, by a majority of one, to demand the keys from the Dean or, if necessary, to break open the door, in order to make an inventory of what should be found therein. In helpless impotence the Sub-Dean, Dr. Heylin, stood by while those deputed to carry out the order not merely broke open the chests but, declaring that there would be “no further use for those toys and trifles,” allowed George Wither, the poet, to march about the room “crowned and royally arrayed…with a thousand apish and ridiculous actions.” Six years later all these historic objects were removed to the Tower, where they were “broken and defaced” and sent to the Mint to be melted down. The destruction was not, however, quite complete, for we are told that Sir Henry Mildmay, the Keeper of the Jewel House and a former royalist, “being as false to his new masters as he was to his old, first pickt out the richest jewels” and then sold them. There is no doubt that a great number of jewels were, in fact, sold, for there exists a very interesting copy of the 1649 inventory of the Regalia in which have been added the names of those who bought precious stones from the Crowns and other ornaments, and the prices paid for them. One, at least, of the purchasers can be identified with a well-known goldsmith with whom Samuel Pepys was subsequently to have some dealings. We know also that at the Restoration a proclamation was issued commanding all persons holding any jewels or plate belonging to the Crown to restore the same, and that, in consequence, one Frances Curson was committed to prison for having received a hatful of gold and jewels at the time of the dispersion of the Crown Jewels. Here, then, we seem to have a possible clue to the persistent tradition that the existing Ampulla or golden eagle escaped destruction in 1649 and is part of the original Regalia. There is no doubt that the vessel in which the Holy Oil was kept up to that date was in the form of an eagle, and its story is a curious one. The Ampulla and the Anointing Spoon. The Ampulla, of solid gold and in the form of an eagle, contains the oil with which the Archbishop of Canterbury anoints the Sovereign. It is believed to have been used for the Coronation of Henry IV in 1399. The Spoon, which dates from the 13th century or earlier and is the oldest piece of plate used in the Coronation, has its bowl divided by a central ridge to enable the Archbishop to place two fingertips in the oil. When Henry IV dethroned his cousin, Richard II, however much he might seek to justify his action, the plain fact remained that he had deposed an anointed king. 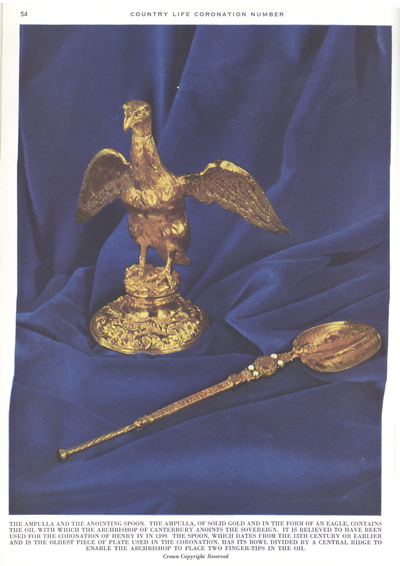 Many of his new subjects were troubled by this and in order to reassure them it was announced that shortly before his deposition Richard himself had found one day at the Tower the Golden Eagle or Ampulla which contained the sacred oil presented in a vision to St. Thomas of Canterbury when in exile by the Virgin Mary for the coronation of future English kings. This Ampulla and its contents, authenticated by Becket, had remained at Poitiers and had eventually been brought to England by Henry, Duke of Lancaster about 1344/47. Richard had wished to be anointed with it, but the Archbishop of Canterbury (Arundel) had refused to allow this, on the ground that he had already been anointed at his Coronation and that the sacrament could not be repeated. Nothing, however, could be more fortunate for Henry IV, and this heaven-sent oil could be, and was, used for the first time at his Coronation, thus immensely strengthening his position. We next hear of it in 1483, when a document, with Richard III’s sign manual at the top, still preserved among the Muniments of Westminster Abbey, states that the King had deposited with the Abbot of Westminster “an Eagle of gold garnyshed with perles and precious stones in which is closed the precious Relique called the Ampulle” and that the King “ordeyneth and willeth that the same precious relique to abide [sic] and remayne after his decesse within the foresaid monastery among the Regalies now lying in the said monastery for evermore.” It was still at the Abbey in 1606, when “an Eagle of golde called the Ampull,” slightly damaged, is mentioned in an Inventory of the Regalia, and it may be the “dove of gould sett with stones and pearle” weighing 8 1/2 ounces which appears in the 1649 Inventory. The weight, however, suggests that this last is more likely to have been a dove broken off one of the sceptres. What happened then no one can say. Sandford, writing in 1687, definitely states that the eagle escaped destruction, and in support of this there is this rather antique-looking eagle still among the Regalia. On the other hand there is the equally definite statement that the eagle was” newly made” at a cost of £102 5s. for the Coronation of Charles II. There is less doubt about the Anointing Spoon. The bowl may have been reworked, or even added later, but there is general agreement that the handle is early 13th-century work or even earlier. Sandford, again, definitely states that the Anointing Spoon escaped destruction, and it is now known from the marked copy of the 1649 Inventory that the “Silver Spoon Gilt” then at Westminster was not sent to the Mint but was sold for 16s. on December 27, 1649, to “Mr. Kynnersley,” who seems to have held a minor post in the Royal Household. It is fascinating to speculate how many jewels from the old Regalia may have reappeared at the Restoration and have been worked by Robert Vyner into the Regalia which he made for the Coronation of Charles II. But no record remains. The Black Prince’s Ruby alone is of unquestioned authenticity; the other historic jewels rest only on tradition. It would be interesting, too, to know how far Vyner was able to carry out his instructions to remake the Regalia so that the various items should “retayne the old names and fashion.” His uncle, Sir Thomas Vyner, to whom he was apprenticed as a young man, was a prominent goldsmith who succeeded in being on good terms with Charles I, Cromwell and Charles II. In 1660 he and his nephew were made joint Masters of the Mint. It is possible that drawings or some other record had been preserved there of the old Regalia before the various items were broken up, defaced and melted down. 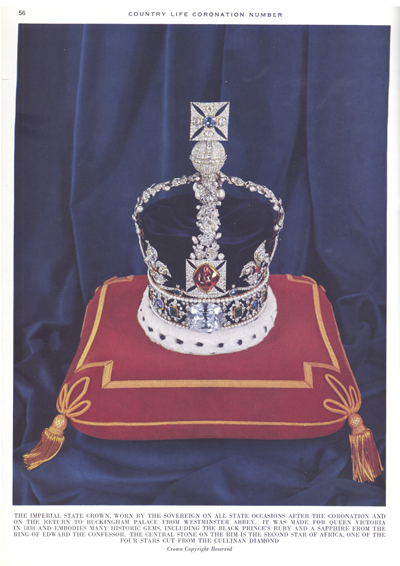 The St. Edward’s Crown, or the Crown of England, the most important item of the Royal Regalia. It was made for Charles II by Sir Robert Vyner, and has been used at each succeeding Coronation. It is of gold and weighs about five pounds. The Archbishop of Canterbury places it on the Sovereign’s head at the climax of the Coronation Ceremony, but it is worn for little more than a minute. But however this may be, the young Vyner seems to have followed the traditional forms, and he did his work well. Although details have been altered, the Spurs, the Orb, and the Sceptres are materially the same as they were made by him, and they have been used at every coronation since 1661. The most important is the Sovereign’s Royal Sceptre with the Cross, the “ensign of Kingly power and justice,” which is about three feet long. The upper portion is wreathed and, below the smooth grip, the end of the Sceptre is thickly encrusted with precious stones. As designed by Vyner the amethyst orb and the cross at the top were supported by a fleur-de-lys, which was subsequently elaborated into an intricate setting of jewelled and enamelled fillets and scrollwork. When the Star of Africa diamond was added to the Sceptre in 1910 the delicate scrollwork was placed horizontally instead of vertically and it now forms the ornamentation which surrounds the great diamond. This setting is so contrived that the Star can be removed, if so desired, and worn as a pendant. One curious item Vyner provided which traces its history to a long past age. This was the “long Scepter, or Staffe of Gold with a Cross upon the top, and a Pike at the foote of steele, called St. Edward’s Staffe.” This Staff, which is four feet seven and a half inches long, remains exactly as Vyner made it. It is carried in the Procession at the beginning of the Coronation Service, but is now not otherwise used. It seems in origin to have been a kind of secular bishop’s crozier which the King carried during the Procession from Westminster Hall to the Abbey. Vyner also designed and made two bracelets to replace those which are mentioned in the 1649 inventory, and were subsequently “delivered to ye Mint” to be melted down. Bracelets were worn by Babylonian and Assyrian monarchs and, in later times, by Teutonic princes. In England they appear among the royal insignia at a very early date, and they continued to be used as such until the 16th century and probably later. Queen Elizabeth I was certainly invested with them at her Coronation. But although they were provided by Vyner, they seem never to have been used, and they have remained ever since among the Regalia at the Tower. They are of solid gold, one and a half inches in breadth, and are lined with crimson velvet. On the surface of the Bracelets are the emblems of the United Kingdom together with the fleur-de-lys of France in champlevé enamel work. Symbolically they are “the Bracelets of Sincerity and Wisdom.” New bracelets, the gift of the Commonwealth, were made for the present Coronation. They are of pure gold, decorated with two narrow bands of engraving and a single Tudor rose serving as a clasp. Charles II was unmarried at the time of his Coronation. The Coronations of James II and Mary of Modena in 1685, and of William III and Mary 11 in 1689, meant that new crowns and sceptres, and a new orb for Mary as a Queen Regnant, had to be provided for the Queens. These are now preserved at the Tower, and some of them are used at the coronations of Queens Consort. Three new Crowns have also been made in recent years. The Imperial Crown of India was made for the visit of King George V to India in 1911. It was originally the King’s intention to “crown himself at Delhi,” but this, eventually, was found to be impracticable, and the curious discovery was made that it was illegal to remove the Crown out of England. A special Crown, therefore, had to be made and the King, in his coronation robes, wore it at the great Durbar at Delhi. Special crowns were also made for the Coronations of Queen Mary and Queen Elizabeth the Queen Mother. In both of these the Koh-i-noor diamond was set. 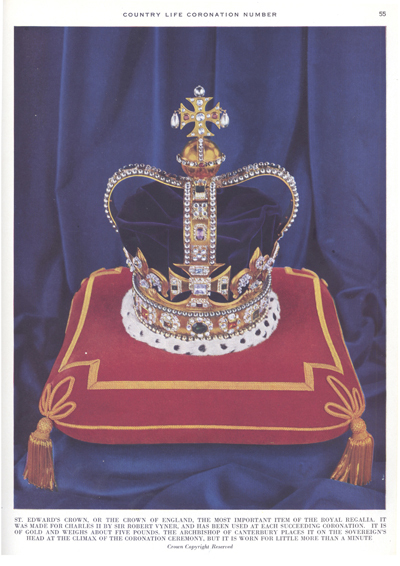 The Imperial State Crown, worn by the Sovereign on all state occasions after the Coronation and on the return to Buckingham Palace from Westminster Abbey. It was made for Queen Victoria in 1838 and embodies many historic gems, including the Black Prince’s Ruby and a sapphire from the ring of Edward the Confessor. The central stone on the rim is the Second Star of Africa, one of the four stars cut from the Cullinan Diamond. Apart from these, and the Imperial Crown made in 1838, the only other notable addition to the Regalia since the 17th century was the jewelled sword made for George IV in 1821 at a cost of £6,000. This is the Sovereign’s personal sword with which he is girded during the ceremony. It is then offered at the Altar, and, after being redeemed for 100s., is carried naked before the Sovereign for the rest of the Service. The sword is of great magnificence with a hilt and quillions almost entirely encrusted with precious stones. At the centre of the quillion is a very large and fine emerald. The scabbard is of gold ornamented with the badges of the United Kingdom, etc. in rubies, emeralds, sapphires and diamonds. A less elaborate sword was provided for the Coronation of Queen Victoria, but at the last three coronations the George IV sword has taken its place. The Coronation Ring, “the Ring of Kingly Dignity, and the Seal of Catholic Faith” consists of a sapphire surrounded by diamonds and set with a cross of five rubies. It was worn by William IV and subsequently by Edward VII, George V and George VI. The Ring used at the Coronation of Queen Victoria was smaller, and by a mistake of the jeweller was made to fit the little instead of the fourth finger. Archbishop Howley, however, insisted in forcing it on to the fourth finger and the Queen had much difficulty and considerable pain in getting it off again. The older and more historic Coronation Ring is now deposited with the Scottish Regalia at Edinburgh. Although it is often said to have been the Scottish Coronation Ring, it is probably “a Ring with a Ruby” enclosed with diamonds which was provided for the Coronation of Charles II. From him it passed to James II, and it was one of the things he took with him when he fled to France. It was almost discovered at Sheerness, where the King, although he was unrecognised, was roughly handled by fishermen who attempted to rob him. With great coolness the King produced a toothpick case and some other valueless trifles from his pockets, and the men were content to take these without searching him further. By this means the Ring was preserved and descended to the Cardinal of York, the last of the Stuarts. On his death in 1807 the Ring and a Badge of the Order of the Thistle were returned by his Executor to King George III. Shortly after his accession to the Throne in 1830 William IV gave orders that they should be deposited at Edinburgh.